Carlo Adinolfi in Extraordinary Extremities. Photo by Stefan Hagen. BOTTOM LINE: A puppet show that teaches lessons of creative resilience to children of all ages. There is, in fact, a reason that children study Greek mythology. If anything, the stories teach young, malleable minds about paradigms of human behavior and illuminate concepts like mortality, humanity, divinity, hope, and destruction. For adults, these stories are the very tools with which we sublimate our worst fears, longings, and struggles, and project them outwardly as epic dramatizations for all the world to see. Extraordinary Extremities is not a Greek tragedy, but it is Greek tragedy-like in that we are meant to see ourselves mirrored in this sweet little tragic tale. This is the story of a man, Geppetto, who is suffering greatly from the loss of his wife and artistic partner, Donna. Geppetto suffers on many levels, and while he labors to understand his loss and to grieve, he must also find a way to continue the show. Geppetto’s livelihood as a performer and puppeteer is at stake, and he knows the show must and shall go on even though he has experienced an irreplaceable, irrevocable, and devastating loss. Through the course of this brief performance (the show clocks in at a very quick 60 minutes), Geppetto sifts almost frantically through the repertory of Greek tragedies that he and Donna used to perform. He enacts each story using Omino and Jenny, his male and female puppets who are the hero and heroine of each Greek tragedy and the wooden counterparts to Geppetto and Donna. In many instances, it looks as though Geppetto is succeeding in overcoming his handicaps right up until the point at which he comes upon a challenge in the performance that he cannot ignore. At such points, it would seem that the show cannot go on. It does, though. The show does go on, and Geppetto finds a way. Sometimes the fix involves switching to a different Greek tragedy, one that seems better suited to the limitations of playing all the parts by himself. Sometimes the adaptation involves rapid physical repairs to Omino’s legs which get broken through the course of the performance and need makeshift repairs and replacements that in some instances better equip Omino to perform the superhuman tasks required of a Greek hero. I need not tell you that there are allusions and symbols everywhere in Extraordinary Extremities: “Geppetto” is the name of the elderly woodcarver who fashioned a wooden boy in the children’s story “Pinocchio,” “Donna” is the Italian word for “woman”, “Omino” translates from Italian to English as “little man.” Beyond these small references, however, there is a larger comparison to be made: Geppetto is a human man suffering an extraordinarily human loss. He is also an artist, though. 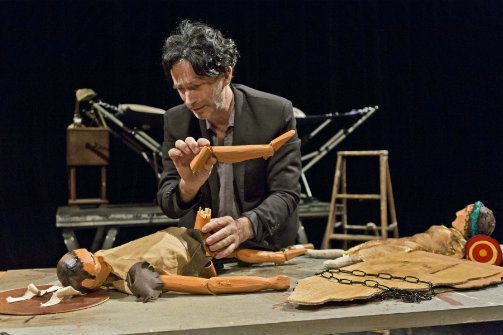 Geppetto is a creator, and, if anything, Extraordinary Extremities is a testament to the power of creativity in providing resilience and the momentum for rebirth. Yes, Geppetto is limited. Yes, Geppetto is subject to circumstances which are beyond his control, but the one divine power that propels him into the realm of the gods is his very god-like ability to create amidst, in spite of, and because of the very human limitations he finds himself in. As a dramatization, Extraordinary Extremities is in many ways imperfect and rough around the edges, but for a theater piece it has both enormous appeal and the ability to teach students young and old about the power of creation and artistry.